Mozilla's research uncovers important ways to promote diversity and inclusion in open source projects. 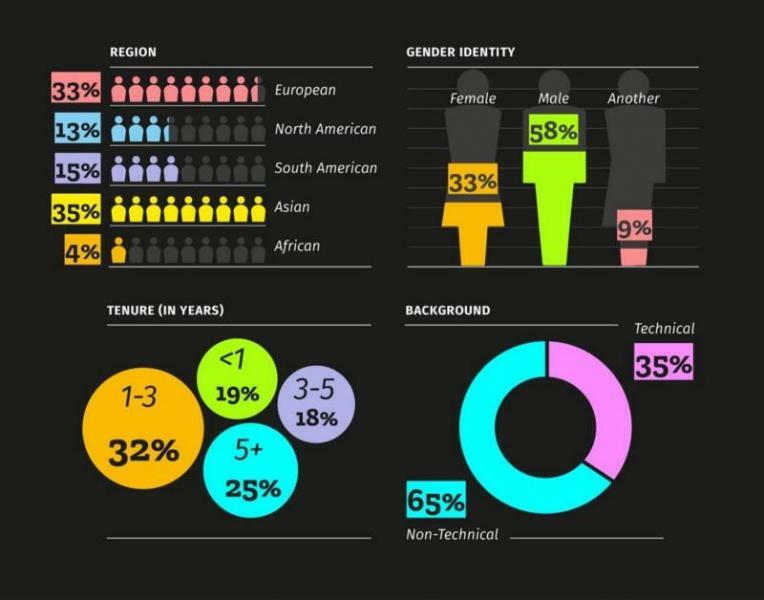 Open source undoubtedly has a diversity problem. In fact, tech has a diversity problem. But this isn't news — women, people of color, parents, non-technical contributors, gay, lesbian, transgender, and other marginalized people and allies have shared stories of challenge for years. At Mozilla, we believe that to influence positive change in diversity and inclusion (D&I) in our communities, and more broadly in open source, we need to learn, empathize, innovate, and take action. Open source is missing out on diverse perspectives and experiences that can drive change for a better world because we're stuck in our ways—continually leaning on long-held assumptions about why we lose people. Counting who makes it through the gauntlet of tasks and exclusive cultural norms that leads to a first pull request can't be enough. Neither can celebrating increased diversity on stage at technical conferences, especially when the audience remains homogeneous and abuse goes unchallenged. This year, leading with our organizational strategy for D&I, we are in investing in a D&I strategy for Mozilla's communities informed by three months of research. Following are early recommendations emerging from our research. For reasons of safety, friendship, mentorship, advocacy, and empowerment, we found positive support for identity groups. Identity groups are sub-communities formed under a dimension of diversity, such as language, gender, or even a specific skillset. Such groups can act as springboards into and out of the greater community. To combat gatekeeping and the myth of meritocracy, community roles must be designed with greater accountability for health, inclusion, and especially for recognizing achievements of others as core functions. The perceived risk of losing productivity and momentum when addressing toxic behavior is shown to interfere with and risk community health. Insights amplified by HR industry findings show that, although toxic individuals are often highly productive, their cost in lost productivity far outweighs their perceived value. Strategies for combatting this in open communities should include cross-project communication about such decisions to avoid alienating or losing contributors. Extending on the notion of cross-project collaboration is the strong sense that building D&I standards into product lifecycles would benefit maintainers and community leaders, create reach, increase collaboration, and break down silos. An analogy is how web standards enable open communities to build on one other's work across various open ecosystems. Project and community events, although trending in positive directions by putting diversity on stage, struggle with homogenous audiences, unclear processes for code-of-conduct reporting, and neglect of neurodiversity issues. A series of recommendations is coming based on this research, and Mozfest has done a great job in past year of building inclusiveness into programming. Quantitative research showed only 21% of our respondents spoke English as a first language. Prioritizing offering all key communications in multiple languages, or providing transcripts that can be easily localized, is important. The intersection of language and other diversity issues raised almost impossible barriers (for example, a new mother whose first language isn't English runs out of time translating a presentation made in English). Contrary to the spirit of openness, many (if not a majority of) projects are working on similar D&I problems—with learning rarely shared between, or even within, communities and projects. New generations of community managers and leaders identify the same issues—and begin again. Later this year, we'll propose an initiative to bring together learning, document ways to build communication, and collaborate towards innovation desperately needed to move the needle in D&I. In our interviews, we were surprised to learn that text-based interviews were preferred not only by those with limited bandwidth, but also those who identified as introverts, preferred anonymity, or have a non-English first language. The simple act of changing the way we talk to people can have wide-ranging impacts, so we should experiment often with different modes of communication. Technical jargon or lingo and overly complicated language were cited as critical challenges for getting involved in projects. Our data shows that technical confidence might be influencing that barrier, and men were nearly twice as likely to rate their technical confidence highly. These findings indicate that it's critically important to limit jargon and to shift from technical posturing to empathy in participatory design. Rust is working on this. In recent conversations with other open project leaders, I've realized this is a pivotal moment for open projects that have adopted codes of conduct. We're at a critical stage in making inclusive and open project governance effective and understood—making it real. Although enforcing our guidelines sometimes feels uncomfortable and even meets resistance, there are far more people for whom empowerment, safety, and inclusion will be celebrated and embraced. Although the people we interviewed want to feel valued, they also said it's important that their accomplishments are publicly recognized in formats with real-world value. It's worth noting that recognition in open communities tends to skew toward people most able to surface their accomplishments and technical contributions, which may exclude more reserved people. Many systems do not adequately protect the information of people who register in community portals, and thus exclude or expose those who prefer to hide personal data for reasons of safety and privacy. The research showed a variety of non-obvious ways we ask for and store gender-identity information. D&I standards are a way forward in providing structure, predictability, and safety in systems, as well as mechanisms to track our progress. More detailed findings on our research and path forward can be found on Mozilla's Open Innovation Blog. Learn more in Emma Irwin & Larissa Shapiro's talk, "Time for Action—Innovating for D&I in Open Source Communities," at Open Source Summit, Sept. 11-14 in Los Angeles.